Americans love seafood – so much so that we consume 7 tons of it each year. Despite our large appetite, many consumers are confused about what fish to eat for their health and even more perplexed about sustainable seafood choices that have less impact on ocean ecosystems. Let’s face it, few people know the difference between tilapia and tuna. But like with other foods, Americans increasingly want to know where their fish comes from. Is it wild caught or responsibly farmed? And with good reason. There are some sobering statistics about seafood. The global share of marine life has been cut in half in the last 40 years and over fishing is reducing food production and biodiversity, which is impairing ecosystem function in the oceans. It’s so critical that the United Nations has initiated the Sustainable Development Goal “Life Below Water,” designed to eliminate subsidies that contribute to illegal, unreported, and unregulated fishing. While shrimp, salmon and tuna are, by far, the most popular choices among fish and shellfish consumers, Americans now seem open to expanding their horizons. 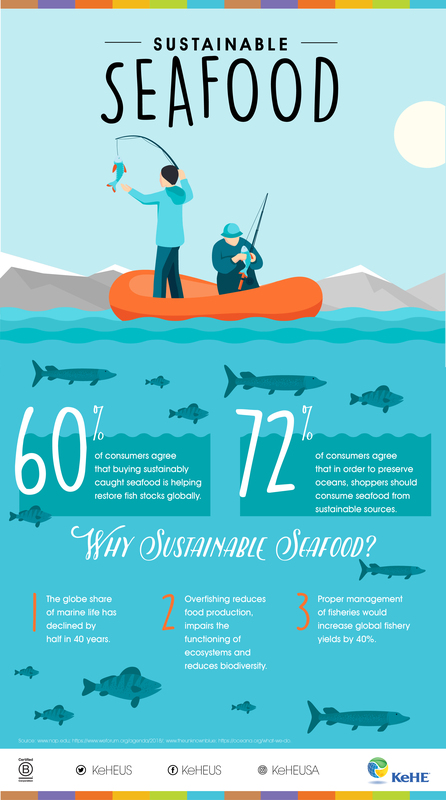 According to 2018 Mintel data, 60% of consumers agree that buying sustainably caught seafood is helping restore global fish stocks, and 72% agree that in order to preserve our oceans, shoppers should consume seafood from sustainable sources. Luckily, there is a growing number of resources to help consumers and retailers make educated choices. Numerous sustainability and sourcing certifications for seafood, such as the Marine Stewardship Council, the Aquaculture Stewardship Council, and Seafood Watch, help identify best choices, good choices, and what to avoid. Here’s to a little Arctic Char on the Barbie!